July 2, after midnight, I wrote a new blog post because I couldn’t sleep due to anxiety over a thyroid sonogram I had later that morning and the overwhelming out-of-pocket expenses I am now facing courtesy of Gov. Greg Abbott, Lt. Gov. Dan Patrick, most members of the Texas Senate, and several members of the Texas House. You see, like my fellow Texas Retired Teachers’ Association retirees--which includes teachers, bus drivers, custodians, classroom aides, librarians, nurses, maintenance workers, police officers, secretaries, and administrators--I am living the TRS nightmare. This is what I learned: Megan works for Dickinson ISD. She first worked as a “paraprofessional” (I have always despised that word.) but has been a certified teacher in the district since March of 2000. She is a current teacher on TRS Active Care 2 – Select. 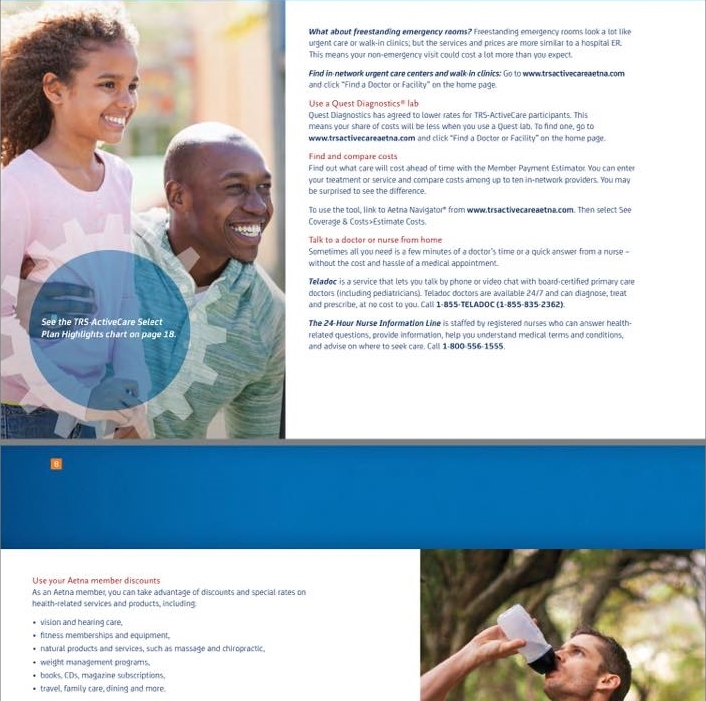 Last school year, she was also on Active Care 2 – Select; however, she was living in Galveston County, so she had an “open network option.” This school year, she was told she has just one option, KelseyCare Aetna. Her KelseyCare Aetna plan started September 1. Megan’s nine-year-old daughter, Kensley, had been under the care of a pediatrician and a pediatric endocrinologist; however, Kensley’s doctors were not on the KelseyCare Aetna plan, so Megan had to find new doctors. She made an appointment with a new pediatrician September 1 to establish Kensley as a patient. Immediately, this new doctor referred Kensley to Texas Children’s Hospital for further testing. Not so fast, according to KelseyCare Aetna. It took Megan over a month, and countless phone calls, to get the approval to make an appointment at TCH. It took another month for the paperwork to make its way from KelseyCare Aetna to TCH. So although Kensley’s doctor referred her to TCH September 1, her first appointment with an endocrinologist at TCH wasn’t until November 16. Any parent would agree that waiting two months for an appointment a pediatrician said should be made ASAP is a nightmare. But according to Megan, that was but a small taste of the nightmare she, Kensley, and their entire family have been living since. The November 16 appointment involved drawing labs. Kensley was scheduled for a thyroid biopsy November 21. While Megan should have been calming the nerves of her little girl the day of the biopsy, she instead had to spend over three hours on the phone, still awaiting approval. That approval was finally granted just 30 minutes before the scheduled biopsy. The results revealed that nine-year-old Kensley had thyroid cancer, which required her to have a complete thyroidectomy in December. She also had to have one of her parathyroid glands removed, and her surgeon took 14 lymph nodes to check for metastasis. After the surgery, KelseyCare Aetna informed Megan that there wasn’t enough documentation to substantiate the removal of Kensley’s thyroid. In fact, they denied coverage for the tumor removal three times, claiming it was not medically necessary, while approving chemotherapy, which was not even an option presented by the doctors at TCH. After more hours on the phone, away from her daughter, and unimaginable stress, the surgery was covered. 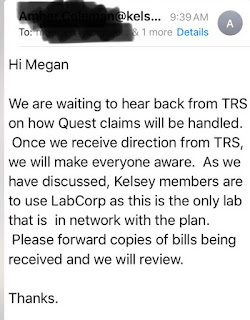 Then Megan was told the lab work done November 16, which cost over $1000, was not covered because Megan used Quest Diagnostics. They claim the plan Megan and her family are on through Dickinson ISD only allows for LabCorp. Megan used Quest Diagnostics because she got on the TRS website even while at TCH that day, and the website clearly displayed that the TRS Active Care 2-Select paid 100% if the member used Quest. However, now KelseyCare Aetna is busy playing the blame game. They blamed Megan for choosing the wrong lab. 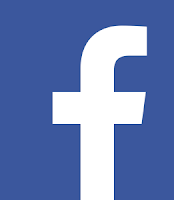 When she told them she had screen shots to prove what she saw on the TRS website, they blamed her district for sharing the wrong information, TRS for posting incorrect information on their site, and even the state. Megan is still fighting this. Just this week, Kensley had to return to TCH for a full day of tests, including five x-rays, and the addition of two prescriptions and two over-the-counter medications. This week’s tests showed no new tumors in Kensley’s thoracic cavity, which is the best news her family has heard since September. They know their little girl faces a lifetime of body scans, ultrasounds, lab work, 3-9 pills a day, radioactive iodine therapy, lymph-node mapping, and more. She continues to endure aches and pains, weight gain, thinning hair, and bald spots. 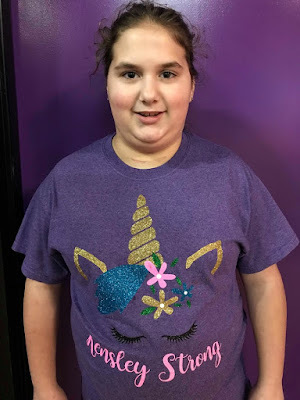 She already has appointments at TCH scheduled for July and August, as well as an ultrasound, oncology appointments, labs, infusions, and more medications scheduled for September. Megan and her family need to focus on precious Kensley’s recovery. Instead, Megan is spending hours on the phone and enduring untold anxiety over denied medical bills because she is a Texas teacher caught in the 2017 Texas Legislative Session’s TRS conundrum. Meanwhile, in Austin, Gov. Abbott has refused to even acknowledge the calls for a Special Session to address the TRS healthcare nightmare. Who can possibly explain what public school employees and retirees across this state ever did to deserve his disdain? So I ask again, Gov. Abbott, Lt. Gov. Patrick, and members of the Texas Legislature, while this mother, a TEXAS TEACHER, can’t sleep because of the worry over her little girl diagnosed with cancer and constant battles over insurance coverage--or lack thereof--HOW CAN YOU SLEEP? Chris Ardis retired in May of 2013 following a 29-year teaching career. She now helps companies with business communications and social media and works as a sales coordinator for Tony Roma's and Macaroni Grill. Chris can be reached at cardis1022@aol.com. We love you Megan & Kensley! Praying for you and our lawmakers to help end this healthcare nightmare. Keep up the good fight. Thank you! We're fighting righting alongside them! I have seen you first hand have to deal with this. 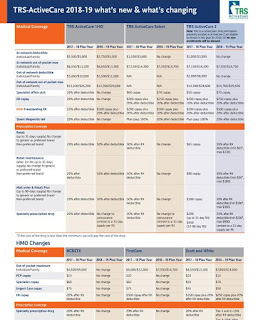 I have two insurance and have had to pay both insurance the out of pocket out of network deductibles because my doctor is out of network. I have switched 3 neurologist. But because I have been diagnosed with Arnold Chiari Syndrome I don't want to switch anymore, costing me thousands in expenses. I hope and pray that your insurance battle will be over and that Kensley gets better. The American health care system is a disaster. It certainly is, and until our lawmakers address it, the nightmare will continue. That, coupled with the fact that Texas lawmakers have determined that all other state employees--including legislators--deserve far superior healthcare than teachers, bus drivers, secretaries, custodians, nurses, police officers, maintenance workers, classroom aides, librarians, cafeteria workers, and administrators has put Kensley and all of us in this situation! Maybe it's time to involve the state insurance commissioner? Some media attention on the local news stations? Dickinson is covered by the Houston media outlets. That's a lot of people hearing about this. The more attention, the better! Rep. Terry Canales, Rep. Jose Menendez, and Rep. Ryan Guillen have officially asked Gov. Abbott to call a Special Session to address the TRS healthcare nightmare, but those requests have fallen on deaf ears, as have all of the calls and emails from public ed employees across the state! According to Mr. Abbott and Mr. Patrick state employees and school district employees have the same insurance but I’ve been a school district employee since 1985 and my husband is a retired state employee. We do not have the same benefits. It used to be some 30 years ago that we had good insurance but in the last 10 years ours gets worse and worse while my husband’s remains stable. These men do not value public school employees. That’s the only explanation I can come up with. An insurance person told me school districts had more claims than the state of Texas. That sounds totally bogus to me. They have parks and wildlife and state police plus the highway department. I don’t believe for one moment that we have more claims. Also the state pays a lot more on their employees plans that school districts do. It’s absolutely ridiculous that we are not valued more for the work we do for the children of our state. Agreed. My husband works for the state and his insurance is great. But my insurance is terrible through the ISD I work for... it doesn't make any sense. When I interviewed Tim Lee, executive director of the Texas Retired Teachers Association during the 2017 Legislative Session, he told me the Texas Legislature appropriated TWICE the amount of money to ERS that they did to TRS, although ERS has HALF as many members. It is no coincidence that retired LEGISLATORS are covered under ERS! I had a similar experience with last year as well. My district didn't communicate the change. I had to fight to go to the higher level and pay an enormous difference just to avoid having to start over with doctors and make sure my children who are away at school are covered. AS IF parents, worried sick about your children, have the time or energy for this unnecessary fight! I'm a Texas teacher close (but not in) to Dickinson. Our insurance premium is going up by 9%, specialists copay up by $20/visit, deductible up by $2,500. 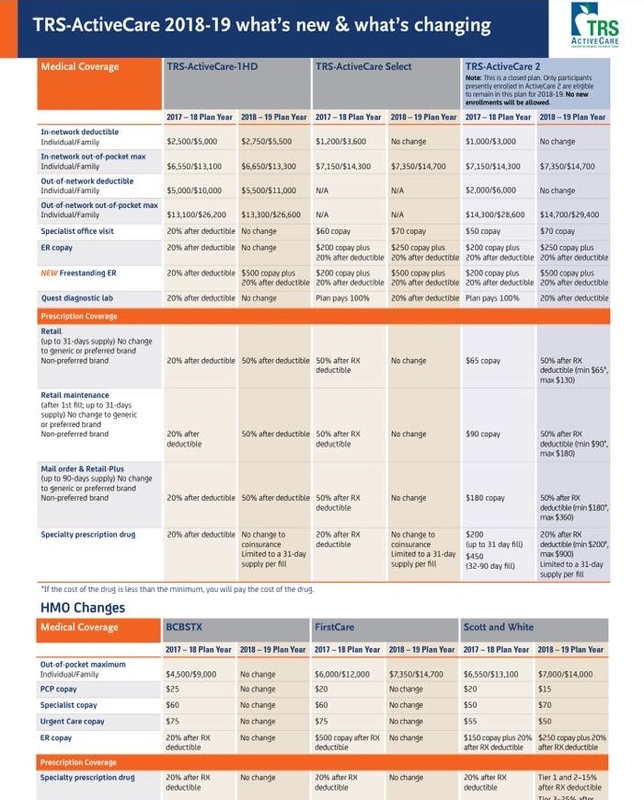 Our max out of pocket increased and they took away the plan level that I'm which I can barely afford so now I have to either choose the lowest plan which only has coverage enough to meet obamacare requirements or go to the higher level plan which I can't afford (and is still crappy coverage). I'm single and almost 50 so I can't go with the lower plan. Not sure what I'm going to do. Private plans are even worse. 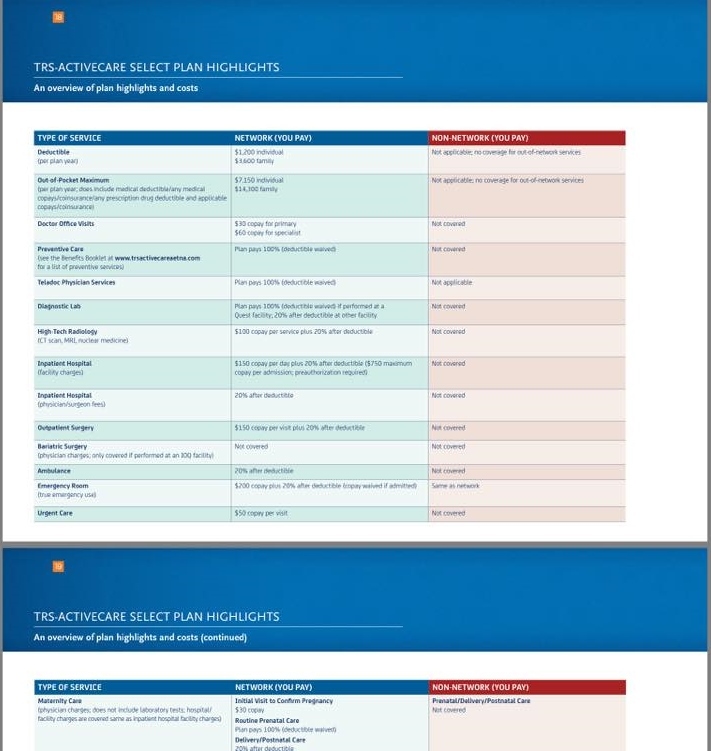 Is it a TRS Active Care plan? Most educators I know have those horrible plans because districts can no longer afford the self-funded plans as a result of all of the funding cuts. Kensley has a mutation in her cancer cells. She meets all of the criteria for some really rough things ahead for random tumors to appear. There are some many treatments that can help and give them an idea where the cancer may appear next. She needs some genetic testing. Aetna - Kesley - denied all of the first requests for testing. They have now recommended 2 small parts - after a fight they have apparently agreed to pay for one of them. 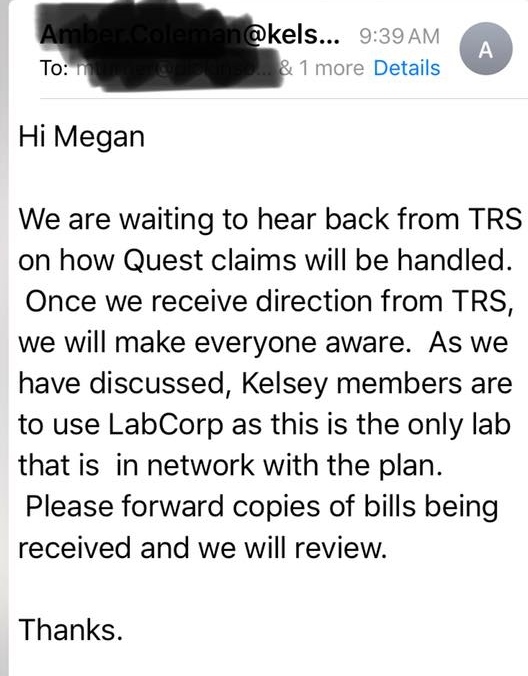 There is a catch - Kelsey can’t run the test and Lab Corp doesn’t offer this 1 part. (They can run the big whole test - that they denied!). Quest can do the test - BUT they are not an approved lab according to Kelsey-Aetna. Now the TCH genetics clinic has to resubmit the lab request to see how and IF they will cover it because Lab Corp can’t do it! I have an idea —- do the whole test she needs AND let Quest do it! Many of us have started calling Gov. Abbott's office again, telling him we are "CALLING FOR KENSLEY" and asking, AGAIN, for a Special Session to address the TRS healthcare nightmare. Let's hope our legislators are reading about Kensley and about all of the other public ed employees suffering because of what they have done. I am so saddened by the experience this family is going through. As a 30 year veteran (retired) teacher I attended the rally in Austin last summer, with a colleague. We were extremely disappointed in the low turn out of teachers, from this great state of Texas. If you think of the amount of districts that are in this state, I would have expected thousands of teachers (active and retired), at this rally. 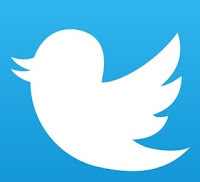 Over the last 36 years of my professional career it is so disappointing that we don't stand up and make our voices heard about our pay/retirement benefits and our insurance....it is purely pitiful. My hope is that with the cost of living rising and our health concerns becoming greater that I will be a bag lady living on the streets of Fort Worth. Once again, this just saddens me. EXACTLY! Until we get LOUD and STRONG and until we VOTE and get everyone we know to VOTE, this will continue to happen to us! This is so stupid. 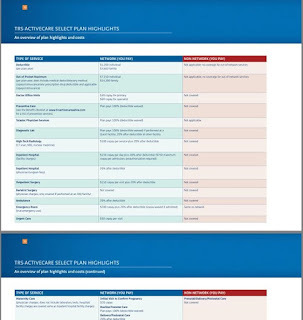 I have worked in education for 12 years and have used the same insurance. But they’re constantly pulling this crap. Example—they approved my $199,000 surgery (I paid $2,000 out of pocket) but I had to fight for weeks for physical therapy to be covered. Da fuq?? They said they’d approve a second reparative surgery if the first one failed. But not the Therapy to ensure recovery. At a time I should have been recovering, I was fighting. PLEASE TELL YOUR STORY to the governor, the lt. governor, and to the House and Senate! They need to be hit with ALL of these stories from both active and retired public ed employees! I was a Texas Teacher for 32 years. I've been a retired teacher for 20 years. I don't know what it's going to take for teachers to wake up and stop being manipulated by the state legislators that those same teachers should hire or fire at the voting polls. It hasn't happened in the last 50 years, but it is time! I began teaching in 1980 and we had great insurance that lasted maybe 7 years, then we went to BC/BS. At the time we all thought it was horrible, but with what we have now, that was excellent insurance. Teacher never has cared about it’s teachers, even though we’ve taught a lot of the government officials, their kids, and their grandkids. They don’t even care about the kids. All they care about is spending wasted money on more state testing, printing it, and paying people to “grade”. ��‍♀️��‍♀️��‍♀️ Thank God, I was able to get our of it in February and go strictly on my husband’s plan (he’s in the media). No special session for this, but you better believe he'll call one for the bathroom bill. Shameful.